Does Ireland really get enough sunshine to make Solar Energy worthwhile? Yes. Believe it or not, Ireland actually gets the same amount of sunlight as most of central Europe (the best approximation would be southern France). This is more than enough to make Solar Panels a viable energy option in Ireland. Do Solar Panels only work when it's sunny? No. Even when it is cloudy, the sun's rays provide plenty of harvestable energy. This is known as 'indirect sunlight', which accounts for 60% of all energy provided by the sun. Only 40% of solar energy comes from direct sunlight, so a bright sunny day is not necessary for generating a viable source of solar power. What do Solar Panels actually generate? Over the course of the year, the energy converted by solar panels can provide roughly 65% of a household's hot water. During the summer months this can rise above 95%. What's the difference between Evacuated Tube and Flat Plate Solar Panels? Evacuated Tube Solar Panels are generally more efficient in terms of energy in cloudy weather conditions (i.e. the weather typically observed in Ireland). Flat Plate Solar Panels, while somewhat less efficient in terms of energy production during periods of poor weather, are more durable and are far less likely to require maintenance at any point, making them more budget efficient options for households. My house is quite old. Can Solar Panels still be attached to it? Yes. Some roof tiles may have to be removed to facilitate the Solar Panels, but this is not a major operation and it will not disturb the interiors of a home in any way. The panels themselves are very light so no structural reinforcement is needed. No. 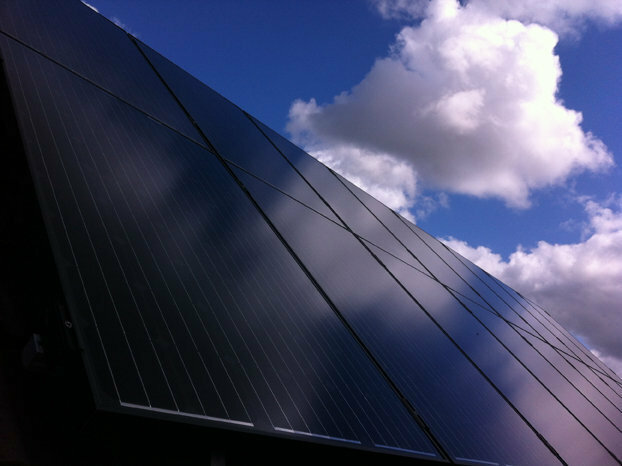 Planning permission is not required to install Solar Panels on domestic buildings in the Republic of Ireland so long as the panels are smaller than 12 meters squared. Where is the best place to put Solar Panels? The optimum position for Solar panels is facing south and at a 45 degree angle. This will catch more sunshine (and will create more energy) over the course of the year in Ireland than any other layout. While Solar Panels can be placed on walls or even on the ground, the roof is generally considered the best spot as it tends to be away from areas of activity, limiting the chances of them getting damaged. Once installed, what are the running costs of Solar Panels? As there are virtually no moving parts (with the exception of a small circulation pump), the cost of running Solar Panels at full energy producing capacity is negligible - in the region of 20c per year. How long does it take for Solar Panels to start 'paying for themselves'? After approximately 4 or 5 years the savings made from energy created by Solar Panels will have completely covered the cost of purchase and installation (as well as the aforementioned small ongoing maintenance costs). After that, the Solar Panels will essentially be creating free energy on an ongoing basis. What other benefits do you get from installing Solar Panels? In addition to the energy savings you will make, the addition of Solar Panels will greatly increase a house's resale value. The house will also benefit from an improved BER (Building Energy Rating). Due to a lack of moving parts, the Solar Panels themselves last a very long time and almost never require maintenance. As it is the only moving part in the whole system, the circulation pump is susceptible to minimal natural wear and tear. It is recommended that the pump is replaced once every 10 to 15 years. Luckily, a circulation pump is an inexpensive item which is easily replaced, usually costing between €10 and €20 - not much of an outlay over the course of a decade or so; working out at about a euro a year. Do Solar Panels come with a warranty? While different companies have different policies, it is usually possible to get a 10 year guarantee which covers repairs and maintenance when it comes to purchasing solar panel products. Are there any grants/subsidies available for buying Solar Panels? Yes. Among the money saving options available to Irish consumers is grant of up to €800 for the purchase/installation of Solar Panels from the SEAI's Better Energy Homes Scheme. More information on this scheme and other means of reducing the cost of Solar Panels can be found here.